Happy 2018, film lovers of Worthing. Missed us? Well, we are back with a punch , cutting through the gloom of the winter months with an exceptional film. 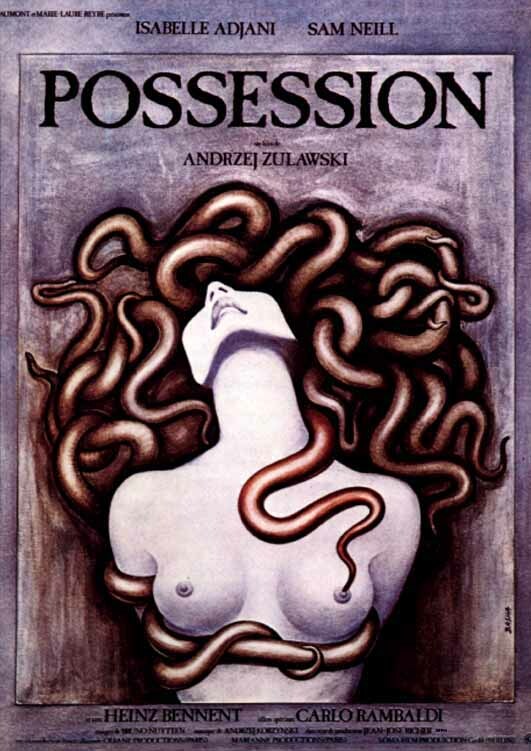 It's the cult classic POSSESSION (1981) by acclaimed director Andrzej Żuławski. Place: At our new home of Coast Cafe. POSSESSION is Żuławski's only English language film, and Isabelle Adjani won the Best Actress prize at Cannes Film Festival in 1981 for her tremendous performance in this cult favourite. Without spoiling anything this film is, as Time Out said in their review "an intimate, intelligent drama about people, about their hold over one another. Adjani’s marriage to Sam Neill is imploding: secret love affairs come to light, harsh words are spoken and screamed, and eventually the knives come out. But that’s only half the story..."
"Possession is like nothing else - an uncompromising and idiosyncratic vision of the divisions that exist around, between and within us all" - Little White Lies . See the trailer here. 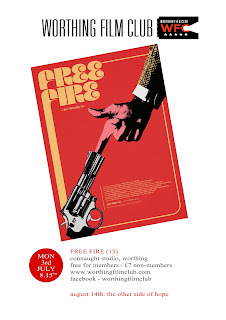 The screening is free to Worthing Film Club members (£25* per year for 12 films* + free use of our extensive DVD library), or £4 to non-members, who can buy tickets on the night. 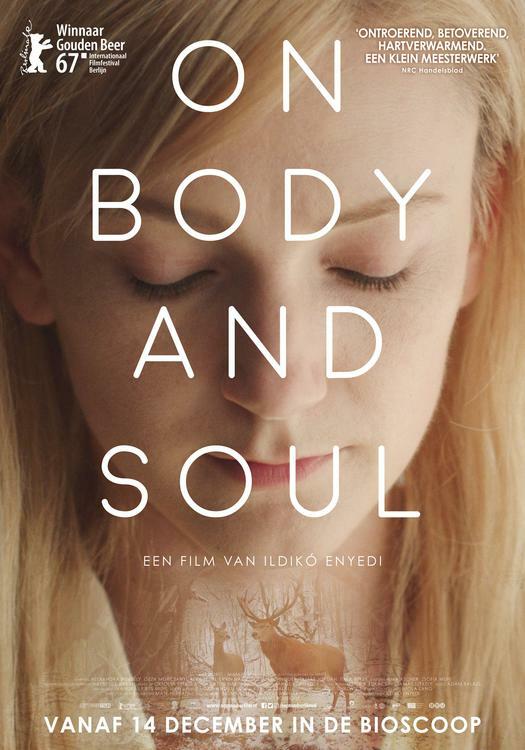 The Berlin Golden Bear winning ON BODY AND SOUL on Monday the 6th of November at 8.15pm. ON BODY AND SOUL was the winner of the Golden Bear and FIPRESCI Prize at this years Berlin International Film Festival. It tells the story of Endre (Géza Morcsányi), the shy manager of a Hungarian slaughterhouse, and Maria (Alexandra Borbély), the new quality control manager. They discover that they share the same dreams, where they are transformed into deer in a winter woodland. It is Director Ildikó Enyedi's eight feature film, and her first of the 21st century, so don't miss out on this unique and original piece of filmmaking. Screening is at the Connaught at 8.15pm on Monday 6h of November. WORTHING FILM CLUB IS 10!!! 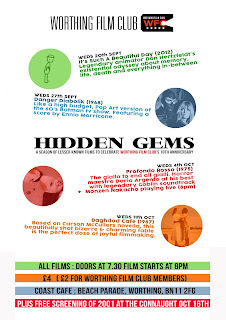 To celebrate we've put together a season of lesser known films, called Hidden Gems! We'll be screening a film every Wednesday at Coast over the next few weeks. Tickets are on the door only, and are £4 or £2 for Worthing Film Club Members, doors @ 7.30pm, films @ 8pm. Last of the season, but not least we have 'Bagdad Cafe' (1987), scheduled for Wednesday 11th October. Based on Carson McCullers novella, this beautifully shot, bizarre and charming fable is the perfect dose of joyful filmmaking. Tickets are on the door only, and are £4 or £2 for Worthing Film Club Members, doors @ 7.30pm, film @ 8pm. Worthing Film Club is TEN! Danger: Diabolik is a 1968 action film directed and co-written by Mario Bava, based on the Italian comic series Diabolik by Angela and Luciana Giussani. The film is about a criminal called Diabolik (John Phillip Law), who plans large-scale heists for his girlfriend Eva Kant (Marisa Mell). Diabolik is pursued by Inspector Ginko (Michel Piccoli), who blackmails the gangster Ralph Valmont (Adolfo Celi) into catching Diabolik for him. Video Librarian noted that the film was "guaranteed to delight viewers whose tastes run to the outré", praising Ennio Morricone's score, Law and Mell's acting, and noting that the "real star is Bava" stating that "the film is colorful almost to the point of garishness." Bava's use of rich color, giving brilliantly artificial-looking compositions, makes the film look like the cinematic equivalent of comic book art. To celebrate we've put together a season of lesser known films, called Hidden Gems! For four weeks we'll be screening a film every Wednesday at Coast. Tickets are on the door only, and are £4 or £2 for Worthing Film Club Members, doors @ 7.30pm, films @ 8pm. First film up is: It's Such a Beautiful Day: An experimental black-comedy-drama animated film directed, written, animated, and produced by award-winning animator Don Hertzfeldt as his first feature film. The film is divided into three chapters and follows the story of a stick-figure man named Bill, who struggles with his failing memory and absurdist visions, among other symptoms of an unknown illness. The film employs both offbeat humor and serious philosophical musings. It received critical acclaim and won numerous awards. 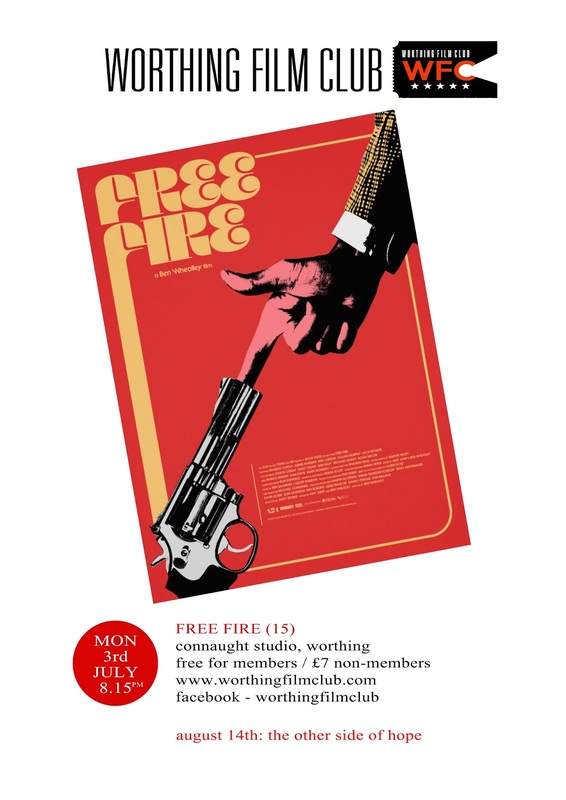 Worthing Film Club membership costs £35 for the year which entitles our members to enjoy free entry to 12 films + free use of our DVD library, as well as priority booking or discounts on special WFC screenings. If you want to join, please email us on worthingfilmclub@gmail.com. 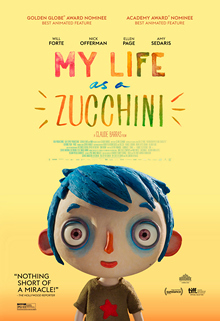 Worthing Film Club are proud to present the Academy Award nominated MY LIFE AS A COURGETTE on Monday the 4th of September at 8.15pm. Winner of two César Awards (the French Oscars) including Best Adapted Screenplay, beating the likes of Frantz & Elle, MY LIFE AS A COURGETTE is the genuinely affecting animation from first time director Claude Barras. Working with a screenplay from acclaimed writer/director Céline Sciamma (Girlhood), it tells the story of Icare (aka Courgette), a nine year old boy who finds himself whisked off to a rural orphanage full of resilient children who’ve also survived abuse and abandonment. The writer and director have cited the Dardenne brothers and The 400 Blows as influences, which is clear in the films longer takes and lingering moments. This beautiful and organically told story should be seen by all, and continues the trend of exceptional animated feature films for any age (RIYL Anomalisa; Your Name; It’s Such A Beautiful Day). Screening is at the Connaught at 8.15pm on Monday 4th of September. The film is free to club members (£35 for 12 films + free use of our DVD library) or £7 to non-members. For non members to book tickets in advance, click here. Worthing Film Club are proud to present the Berlin Silver Bear award winning THE OTHER SIDE OF HOPE on Monday 14th of August at 8.15pm. Finnish auteur and king of deadpan Aki Kaurismäki (Le Havre, The Man Without a Past) returns with this award winning story of an unlikely friendship between a Syrian asylum seeker and an elderly Finnish restaurant owner. Khaled (Sherwan Haji) arrives in Helsinki hidden in a coal container, after fleeing war-torn Syria. He meets Wikström (Sakari Kuosmanen), a former shirt salesman who has recently left his wife for a new life as a bachelor restaurateur. 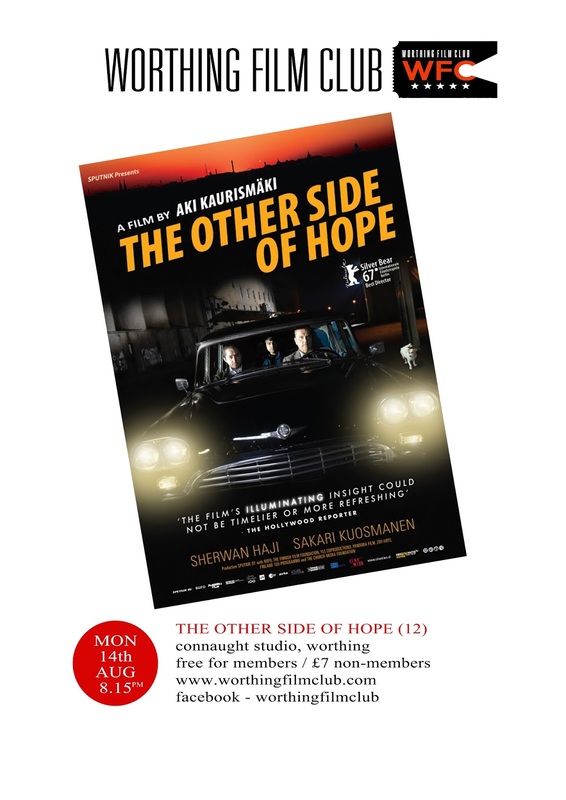 Featuring Kaurismäki's trademark sight gags and one liners, THE OTHER SIDE OF HOPE is a timely film from one of the world's leading filmmakers. Screening is at the Connaught at 8.15pm on Monday 14th of August. The film is free to club members (£35 for 12 films + free use of our DVD library) or £7 to non-members. Non-members can buy tickets on the night or in advance from here. 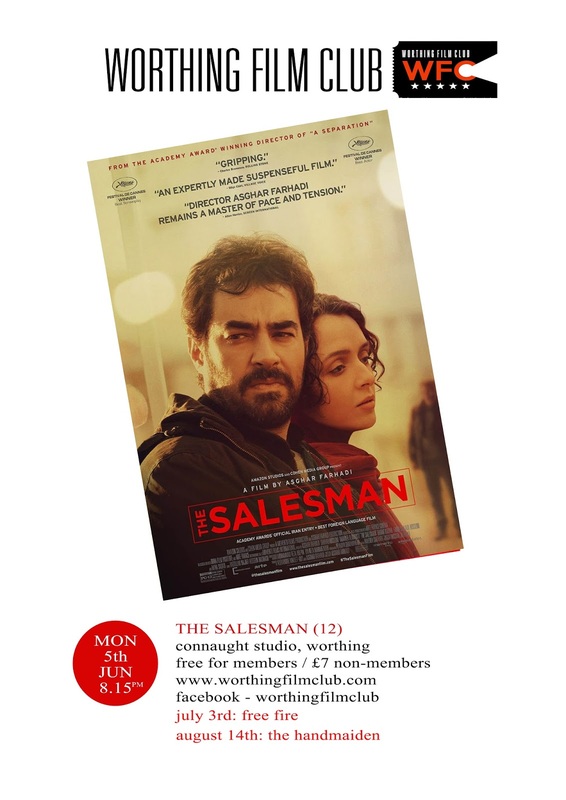 Worthing Film Club are proud to present the OSCAR award winning THE SALESMAN on Monday 5th June at 8.15pm. Asghar Farhadi (A SEPARATION; THE PAST; ABOUT ELLY) returns with the story of a young couple who play the lead roles in their local theatres presentation of Arthur Miller’s 'Death of a Salesman'. Their relationship suffers after they move into an apartment that was previously occupied by a prostitute, as their life begins to mirror their art. The film was thrust into the spotlight as the filmmakers would have been denied entry to the States for the Oscars, due to Donald Trumps attempted immigration ban. In London there was a free public screening held at Trafalgar Square on the night of the Oscars, in support of the film and in protest to the ban. The film went on to win the Best Foreign Film Oscar that evening, in what partly represented a protest vote against Trump by the Academy. The film itself premiered at Cannes 2016, where it picked up two awards, for best screenplay and best actor. THE SALESMAN has been described as another wrenching and nuanced study of empathy, intellectual filmmaking at it’s best, that sits well in the filmmakers already excellent canon of work. Worthing Film Club are proud to present 'THE YOUNG GIRLS OF ROCHEFORT' (Les Demoiselles de Rochefort ) a 1967 French musical film written and directed by Jacques Demy (UMBRELLAS OF CHERBOURG, PEAU D'ANE) on Tuesday 2nd May at 8.15pm. Demy’s distinctive, celebratory vision of life is so very much present in this film and tells the story of two beautiful, effervescent sisters Delphine and Solange (played by real-life twins Catherine Deneuve and Francoise Dorleac) as they swish through their apartment and Rochefort’s public squares, trilling their fondness for “catchy tunes, silly puns and repartee”. When the carnival arrives, bringing with it two brightly-tailored suitors (George Chakiris and Grover Dale), they’re given a chance to become performers and later to leave for Paris, the sophisticated metropolis of which they have always dreamed. Art directed by Bernard Evein and choreographed by Norman Maen, the film has been lovingly restored under the supervision of Demy's widow, Agnes Varda, doyenne of the French New Wave. It pings with pastel colours and chimes with some of the finest melodies Legrand has ever composed, and picked up an Oscar nomination for Best original Score. Both the singing and dancing are infectious and flamboyant, making this film the perfect 'pick me up', feel-good movie that was an influence on the the recent hit LA LA LAND. 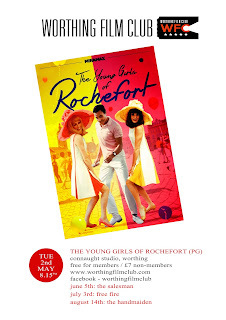 Screening is at the Connaught at 8.15pm on Tuesday 2nd May (Please note this is a Tuesday screening! ).The film is free to club members (£35 for12+films + free use of our DVD library) or £7 to non-members (click here to buy non-member tickets) . 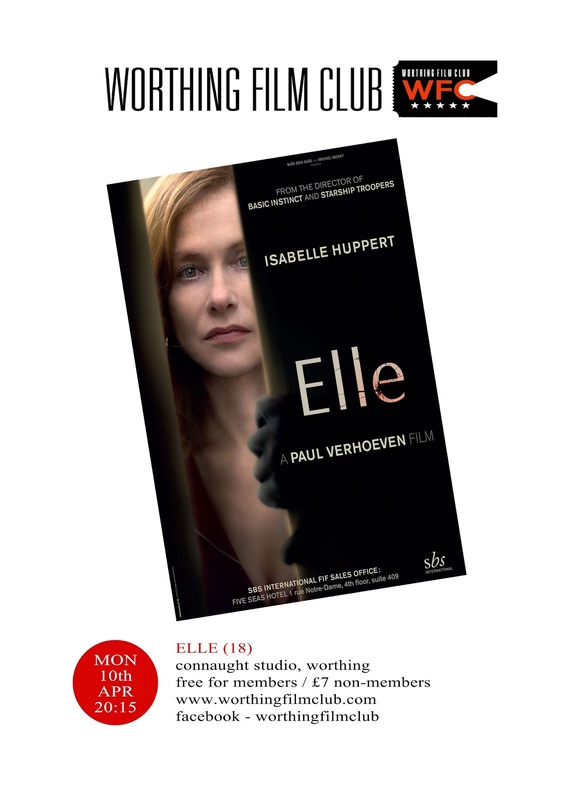 Worthing Film Club are proud to present the critically acclaimed 'Elle' on Monday April 10th at 8.15pm. Director Paul Verhoeven' s latest film is both an outrageous black comedy and a deadly psychological thriller. Isabelle Huppert (Amour, 8 Women, Heaven's Gate) plays a successful businesswoman who gets caught up in a game of cat and mouse as she tracks down the unknown man who raped her. 'Elle' premiered in competition for the Palme d'Or at the 2016 Cannes Film Festival where it received critical acclaim. It won the Golden Globe Award for Best Foreign Language Film and Critics' Choice Movie Award for Best Foreign Language Film. Huppert's performance is outstanding, and considered to be one of the finest of her career. She was nominated for the Academy Award for Best Actress. 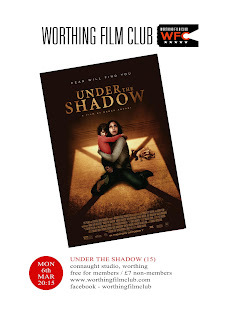 Worthing Film Club are proud to present the BAFTA award winning Under The Shadow on Monday March 6th at 8.15pm. As a mother and daughter struggle to cope with the terrors of the post-revolution, war-torn Tehran of the 1980s, a mysterious evil begins to haunt their home. Director Babak Anvari with his directorial debut, uses disparate film genres to give us an gripping chiller with timely themes and thought-provoking social subtext. The film premiered at the 2016 Sundance Film Festival and it was selected as the British entry for the Best Foreign Language Film at the 89th Academy Awards. Last year, the film received the H.R. Giger Narcisse prize for the Best Movie at the Neuchâtel International Fantastic Film Festival. In December, Mark Kermode named Under the Shadow the best film of 2016, stating that its menace and foreboding echoed Jennifer Kent’s The Babadook, while listing the film’s influences such as Polanski’s Repulsion and The Tenant. This film has more than one way to make you jump. 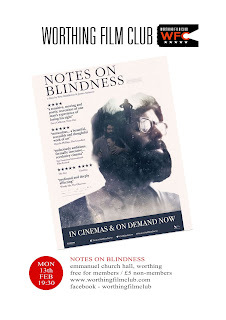 NOTES ON BLINDNESS is an extraordinary visualisation of theology professor John Hull’s audiotape records of his descent into blindness. Utilising the mimed “verbatim theatre” technique, where the actors lip-sync to the original recording, NOTES ON BLINDNESS blurs the boundaries of what makes a drama and a documentary. This deeply affecting sensory experience was expanded upon its release, to maximise it’s accessibility. The film was release as we will see it, but also with audio-description, and as an enhanced soundtrack version, with the latter turning the film into a singular aural experience. Alongside this, the co-directors James Spinney and Peter Middleton created 'Notes On Blindness: Into Darkness', an immersive virtual reality experience. Nominated for three Baftas (British Film, Best Documentary, Outstanding Debut) we're backing thiswonderful film to be the worthy winner of an award or two. The Baftas take place the night before our screening, so keep your eyes peeled! 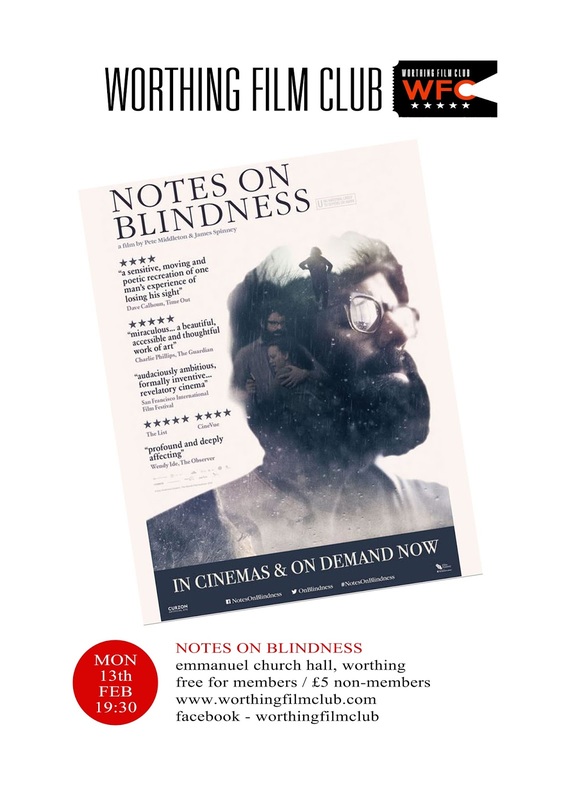 Doors will be open at 7pm, with the screening at 7.30pm on Monday 13th of February at Emmanuel Church Hall, St Michael's Rd (entrance on Heene Road, opposite and down from Heene Community centre). Please note that we will be putting on a bar too, so do come early for a pre film drink. Our second presentation for January is 'Hunt for the Wilderpeople' written & directed by Taika Waititi, (What We Do in the Shadows; Eagle Vs. Shark, Flight of The Conchords). Waititi gives us another poignant and moving comedy-drama that focusses on the unlikely relationship between one reluctant 'uncle' (played by Sam Neill) with his foster nephew (played by Julian Dennison). Then, during a hunting expedition this 'odd couple' get lost in the New Zealand outback and become the cause for a national manhunt. This charmingly offbeat adventure story unites a solid cast, a talented filmmaker, and a poignant, funny, deeply affecting message, that was named Film Of The Year by Empire magazine. Screening is at 8.15pm on Monday 23rd January at the Connaught Studios, Worthing. Our next screening will be on Monday February 13th at Emmanuel Church Hall. Film tbc. 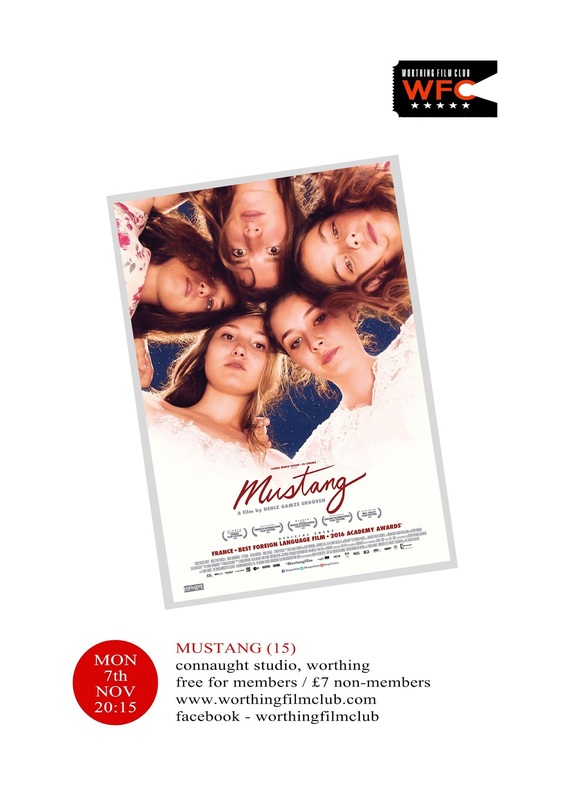 Our January film is the rescheduled screening of MUSTANG. The 2015 directorial debut of Turkish-French film director Deniz Gamze Ergüven, MUSTANG is set in a remote Turkish village and depicts the lives of five young orphaned sisters and the challenges they face. A gritty brutal coming-of-age story that grabs you with its own sense of haunting melancholy, as well as an increasing feeling of urgency and outrage. Internationally acclaimed, MUSTANG was shown during 2015 Cannes Directors Fortnight where it won The Europa Cinemas Label Award. It was also nominated for Best Foreign Language film at 88th Academy Awards as well as at the Golden Globe Awards, and won four at Paris's 41st César Awards. 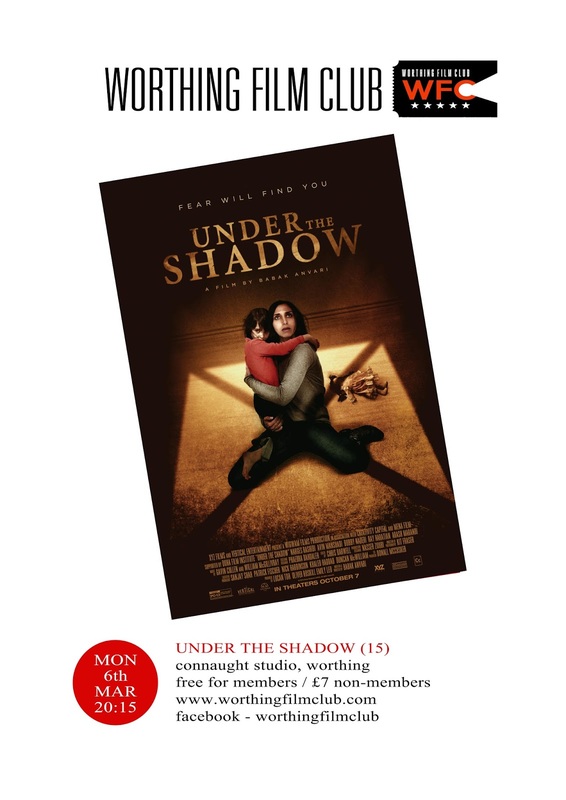 Screening is at 8.15pm on Monday 9th January at the Connaught Studios, Worthing. Tickets from the previous November screening are still valid. Our next screening will be on Monday January 23rd. Film tbc. 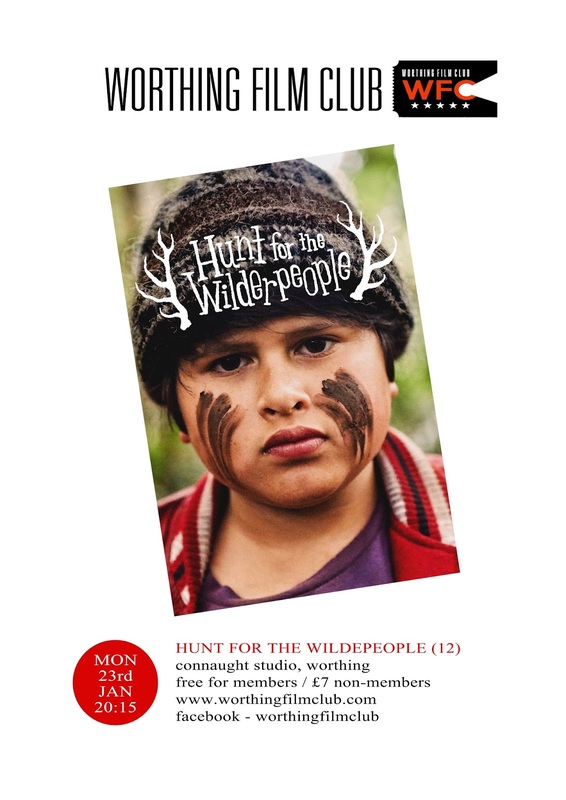 We go crazy in January with a second Worthing Film Club Screening on 23rd January of New Zealand comedy drama 'Hunt For The Wilderpeople' - details to follow.